I stumble on books in a lot of ways—including, apparently, The New Yorker. I don’t actually read it, but I occasionally encounter an article online. Somewhere I found an article discussing Enlightenment Now by Steven Pinker. It made the book sound intriguing enough that I picked it up—though it may have led me astray a little too! The New Yorker article gave me the impression this was a book about how, contrary to the popular view, the world (society, the human experience) is in fact improving. Considering how often the news cycle makes me feel the exact opposite–yes, please, I’d like to hear that argument! 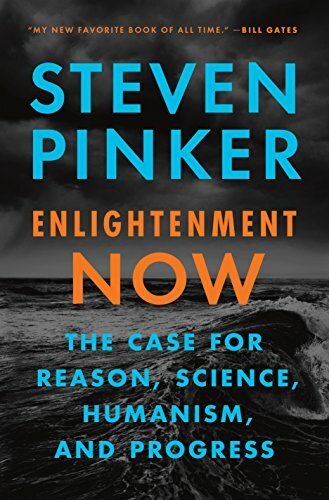 And that part of Enlightenment Now was very good–but I’m not sure that’s actually what Pinker intended his book to be about. The book opens with, as wasn’t too shocking because of the title, a discussion on the history of the enlightenment and enlightenment values. Not fascinating, to be honest, but engaging enough. Then he got into the section The New Yorker wrote about, and made a pretty compelling case. In brief, taking the long view (over a few decades, perhaps a couple of centuries), life expectancy has increased, poverty has decreased, diet is improved, health is improved, democracy has spread, literacy has increased, violence has fallen, civil rights have increased, standard of living has risen…and all by huge margins. Now, that’s taking the global view, and Pinker is careful to note that he’s not saying any of these problems have gone away, and that there isn’t still poverty and disease and violence–but looking at the numbers, on a global scale, the world is a better place than it was even 50 years ago. It’s hard for us living it to get that perspective. I didn’t entirely buy into his every view, but I have to admit it was an encouraging read. And parts of it at least did fit into things I’ve heard before, just not put together so completely. Hans Rosling on poverty, for example, is pretty amazing. And just to be clear, this book wasn’t written in 2015–it came out this year, and he devotes an entire chapter to a certain president and how he runs counter to enlightenment values. That segues well into the latter portion of the book, which is when Pinker lost me again. You see, I really don’t think his focus was intended to be on the world improving–it was on the importance of enlightenment values. After he shows what they’ve done in the past, he turns to the present and the future, with a sweeping defense of science that was good enough but kind of dull (because…I know, I’ve marched for science) and a sweeping attack on religion. On that, I’ve heard it all before and he had nothing very compelling, I felt–and for a man who really, really emphasizes rationality, I think he had a big blind spot to his own logical fallacies regarding religion (setting up a straw man, mainly). So…I found half of this book fascinating, compelling, and rather comforting–and the other half either dull or vaguely bothersome. And I don’t know how to conclude a judgment on a book with that situation! I guess I recommend reading half of it–or maybe just watching Hans Rosling, since it’ll bring you to a similar place.